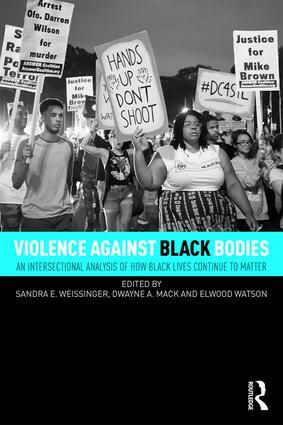 Violence Against Black Bodies argues that black deaths at the hands of police are just one form of violence that black and brown people face daily in the western world. rough the voices of scholars from different academic disciplines, this book gives readers an opportunity to put the cases together and see that violent deaths in police custody are just one tentacle of the racial order—a hierarchy which is designed to produce trauma and discrimination according to one’s perceived race-ethnicity. 1 The Fires of Racial Discontent are Burning! Intensely! 10 It’s "Young Black Kids Doing It": Biased Media Portrayals of the Deviant in Britain? Sandra E. Weissinger is Assistant Professor of Sociology at Southern Illinois University, Edwardsville.She has recently contributed chapters to Race, Class & Gender: An Anthology (Cengage, 2016), Beginning a Career in Academia: A Guide for Graduate Students of Color (Routledge, 2015), and Research Justice: Methodologies for Social Change (Policy Press/University of Chicago, 2015). Dwayne A. Mack is Associate Professor of History at Berea College. He is the lead editor of Beginning a Career in Academia: A Guide for Graduate Students of Color (Routledge, 2015), Mentoring Faculty of Color: Essays on Professional Advancement in Colleges and Universities (McFarland Publishers, 2013), and author of Black Spokane: The Civil Rights Struggle in the Inland Northwest (University of Oklahoma Press, 2014). Elwood Watson is Professor of History and African American Studies at East Tennessee State University. He is the editor and co-editor of several volumes including Generation Speaks: Voices from Academia (Scarecrow Press, 2013), Beginning a Career in Academia: A Guide for Graduate Students of Color (Routledge, 2015), and The Oprah Phenomenon (University of Kentucky Press, 2007). His most recent authored book is Performing American Masculinity: The Twenty First Century Man in Popular Culture (Indiana University Press, 2011).